When Jill sent this parcel to our office, I got to thinking about our first meeting and just how different things are now. It was a couple of years ago, I was delivering digital training across Yorkshire and she was working on the same programme. We connected immediately, two northern chatty lasses having a right banter! Time rolls forward and she’s been a busy lady designing websites for businesses but also following her passion to launch her own cosmetics and skincare range. I was genuinely over the moon to receive the parcel, all beautifully wrapped in brand colour tissue and tied with raffia string. I felt really proud of this gutsy lass. 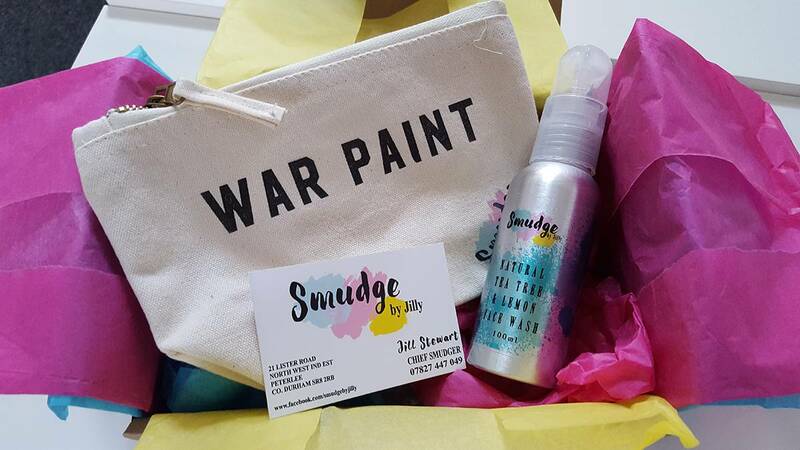 Hidden within the parcel was a 100ml tube of Natural Tea Tree and Lemon Face Wash, £12 and a fab makeup bag emblazoned with War Paint (true enough most days!) which retails at £10. The face wash is lush. A really subtle mix of tea tree and lemon, the lemon fragrance wins out for me, handy as I love fruity fragrances. My face felt really clean after using it and it’s especially good for oily skin (mine isn’t so I’d probably use the product every other day). Jilly is developing a full range of skincare products and hand poured soy candles which are cruelty free, only tested on humans, organic and the ingredients are sourced in the UK. Next on my list to try; the scrumptious looking lip balm and glosses. If you’re keen to support small, local businesses, then jump over to Jilly’s website and take a look around.